You can only control 1 “Yoko, the Graceful Mayakashi”. You can only use each of these effects of “Yoko, the Graceful Mayakashi” once per turn. 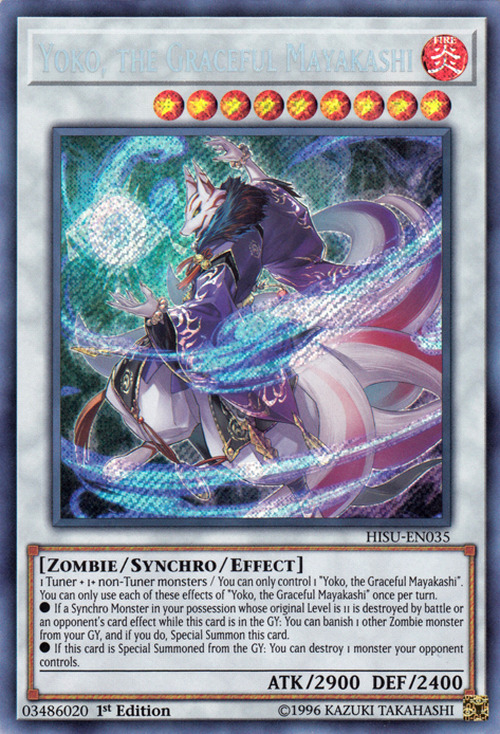 ● If a Synchro Monster in your possession whose original Level is 11 is destroyed by battle or an opponent’s card effect while this card is in the GY: You can banish 1 other Zombie monster from your GY, and if you do, Special Summon this card. ● If this card is Special Summoned from the GY: You can destroy 1 monster your opponent controls. This card is based in the Kyubi (狐狸精) or nine-tailed fox (九尾狐), a common motif in the mythology of East Asian countries. In East Asian folklore, foxes are depicted as a familiar spirit possessed of magic powers. These foxes are depicted as mischievous, usually tricking other people, with the ability to disguise themselves as a beautiful woman. This card being Level 9 is a reference to the Kyubi’s nine tails. 妖狐 yōko roughly translates to fox yōkai. This monster is the Synchro counterpart of Dakki, the Graceful Mayakashi.